Keeping track of Passive House buildings worldwide is essential if we want to get a clear picture of the overall development of the Passive House movement. 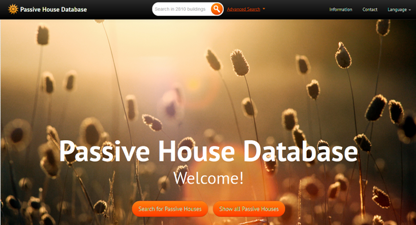 It is in this light that we remind you to register any Passive House projects on which you have been involved on the international Passive House database. Be sure to encourage others to do the same! Registration is free of charge. The international database facilitates the participation in the International Passive House Days every November, the key Passive House awareness raising event. Check to see whether your project is already in the database. You can search based on a variety of criteria and keywords. If you find your project in the database, please note its project ID number. Check to make sure the details listed are complete and correct. Changes and additions, especially more photos, should be sent via email to passivhausprojekte@passivhaus-info.de. In order to add a project to the database or to register for the International Passive House Days, you must first register as a new user and click “New registration”. Once you have completed your registration, you will receive an email with your password. Please understand that database entries are not anonymous. Your personal details, however, will only be used internally and will not be given to third parties. You can now login to the user area with your user name and password, where you can register your project and sign up to show your project during the International Passive House Days. For help entering your project, your may refer to the “Help – project entry” section in the user area. Once you have filled out and sent a project form, you will receive a project ID number, which you will need should you wish to sign up for the International Passive House Days. The project details will be checked and then put online. You may amend the information and add photos as long as the status in the form remains red. Once you give us the okay to publish your data, the status will turn yellow and you will then no longer be able to make changes on your own. If you would like to sign up for the International Passive House Days, enter your project ID and all other required information under dates / New entry. These details will be checked and then put online. Should you have questions, we would be happy to help. Contact either iPHA at info@passivehouse-international.org or Ulrike Nagel at passivhausprojekte@passivhaus-info.de.